I finally came across a situation where the Text Image function would be useful--but it does not appear to work on Windows XP. When I highlight an area in the viewer and click the "Text Image" button, i get an error: NSInvalidArgumentException--GSCInlineString(instance) does not recognize colorValue. 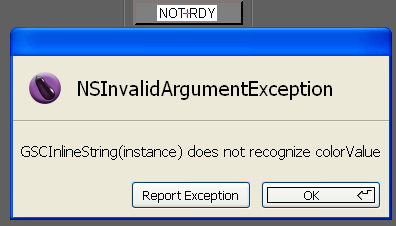 Is this functionality indeed not supported on XP--or is something else maybe wrong? SS attached. It's fully supported on XP, but it looks like you have encountered a bug -- we're looking into it. A reinstall fixed it on the one local instance that had the same problem.